Sen. Robert Menendez launched a wide-ranging attack on the corruption charges against him Monday, accusing Justice Department prosecutors of misconduct and setting the stage for what is likely to be a confrontational and heated court fight. Attorneys for the Democrat filed a series of motions to dismiss the 22-count indictment against him and the Florida eye doctor who allegedly bought the senator's influence with luxury vacations and campaign donations. Among other claims, the motions accuse the government of prosecutorial misconduct for allegedly intimidating witnesses and presenting false testimony to a grand jury. They also claim prosecutors improperly presented evidence to the grand jury that should have been off-limits under laws governing legislative activities. Prosecutors "advanced salacious allegations of sexual misconduct, intimidated and coerced witnesses in the Dominican Republic with threats of criminal and immigration sanctions, intimidated Senator Menendez's own family members, harassed and abused staff members and other witnesses before the grand jury by asking inflammatory questions designed to infect the grand jury process," according to one filing. A Justice Department spokesman didn't immediately comment on the accusations. 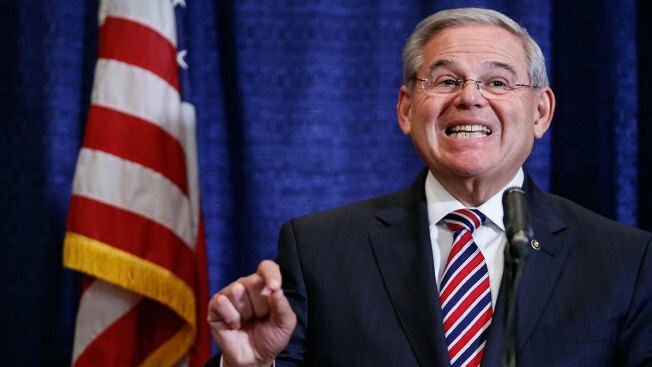 Menendez, a congressman for more than 20 years and a member of the Senate since 2006, is charged in 14 counts of the indictment with accepting gifts and donations totaling about $1 million from ophthalmologist Salomon Melgen in exchange for political favors. The gifts included flights aboard a luxury jet to the Dominican Republic and a Paris vacation. Menendez has claimed he and Melgen have been friends for years and that he did nothing illegal. Melgen also is charged in a separate indictment in Florida accusing him of multiple counts of Medicare fraud.